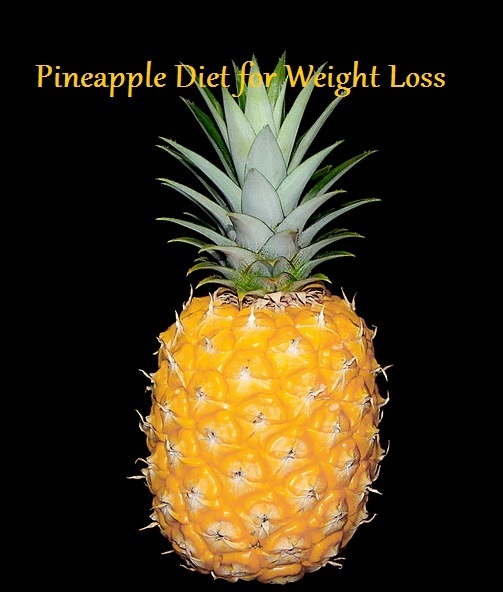 Pineapple Diet Plan – How does it work for Weight Loss? Pineapple is a fruit that is loaded with fibers, vitamins, minerals, antioxidants and other nutrients that are needed for a healthy body. It has high water content and few calories. So it is excellent for weight loss. It also cleanses your body and make it toxin free. You can have pineapple as it is or in combination with other fruits in fruit salads. Pineapple juice is also taken, which is very nutritious and provides you with instant energy. Pineapple is also used in making various dishes. Jams and squashes made of pineapples are very tasty and popular with children. In addition to many of its health benefits, it is also very beneficial for your skin and makes your skin look young and glowing. It also keeps your skin hydrated and helps to get rid of the cracks that form on your feet. You can also use it for ex-foliating your skin. Three day diet plan include consuming of pineapple in combination with tuna. Here the weight loss is attained by having pineapple in combination with a balanced diet and not just eating only pineapples. When you follow this diet your body is not starved nor is it made weak. This diet ensures that when the weight loss is made, your body remains healthy. When you follow the three day pineapple diet you have to take pineapple as well as tuna. Tuna is rich in proteins helps you to get the maximum benefits from the diet. It also makes the process of weight loss fast. You have to consume about 2 kg of pineapple in a day and 2 to 4 ounces of tuna with the main meal of the day. You can also consume other nutritional supplements to balance the diet. This includes raw vegetables, nuts, fat free yogurt and so on. One more thing you should ensure when you follow this diet is to drink lots of water. This helps in detoxifying your body by flushing out all the toxins that are forms in the body. Moreover, it protects your body from the acidity that may occur as a result of the enzyme and acid present in pineapple. By following this three day diet, it is said that you can lose up to 5 kg of weight. This diet is easy to follow and is also very inexpensive as pineapples are available easily and are not very costly. It is also very nutritious and do not harm your body in any way. It is rich in Vitamin C, which is an excellent antioxidant. Manganese found in pineapple is very important for the reactions of various enzymes. It is also essential for the proper functioning of the thyroid and the kidney. The potassium contained in pineapple is needed for controlling heart beat, as well as for healthy muscles and the nerves. So, by following this three day diet, you can easily lose weight and have a slim and trim look for a special occasion. This diet is to be followed only for three days and no more. If you wish to try it again, you can do so after a few days. This diet does not make you feel weak as it is rich in vitamins and minerals. Once the diet program is over, you must start having your normal diet. But you must take care to maintain the weight that you have achieved. Because of the abundant antioxidants present in pineapple, it fight against the free radicals found in the body and helps in preventing various types of cancers that may occur in the body. Consuming pineapples is good for your bones and keep them healthy. This is because of the high amount of manganese present in pineapple. I cup of pineapple juice provides you about 73% of the manganese that you require per day. Old people, who are at a risk of bone damage benefit a lot by consuming pineapple. It is also good for the teeth as it prevents the growth of bacteria in the mouth and keep the teeth strong and healthy. Pineapple is a fibrous fruit and is rich in essential fibers and a number of nutrients like manganese, Vitamin C, potassium, magnesium, proteolytic enzyme called bromelain, thiamin etc. All these nutrients provide pineapple with anti inflammatory, anthelmintic, antimicrobial and antitoxic properties. So pineapple is excellent for the treatment of many diseases like sinusitis, arthritis, obesity, indigestion, respiratory disorders, intestinal infections, cough and cold, inflammations, blood clotting and so on. It is also useful in reducing blood pressure. Pineapple is good for those suffering from arthritis. Having half a cup of fresh pineapples help to reduce the pain due to arthritis. Pineapple detoxifies your body and protects you from various infections. It also enhances the process of digestion, which in turn makes the metabolic activities smooth, helping in the effective absorption of the nutrients by the body. So it aids in the reduction of the unwanted fat in the body. The complex protein in the body is broken down into simple forms with the help of bomelain, fibers and Vitamin C contained in pineapple. As a result, the absorption of nutrients is increased and also the energy, immunity and metabolism are increased. This leads to a reduction in the weight and helps you to fight obesity. The antioxidants help in reducing the level of cholesterol in the body preventing heart diseases. Vitamin C and bromelain present in pineapple fight against common cold and cough. If you are suffering from a bad cold and cough, include pineapple to your diet and you will soon get relief from cold and cough. Vitamin C present in pineapple makes your body immune to various diseases. Water Fasting for Weight Loss – Does it Help?